While many cars are built to last, eventually even the most reliable vehicles break down. When this happens, knowing how to talk to the auto mechanic and communicate the symptoms your vehicle exhibits goes a long way toward getting your vehicle fixed right the first time – and it saves you money by avoiding unnecessary repairs. To accurately describe a problem with your vehicle and make sure the mechanic understands what exactly is wrong with your car when you take it in for repair, take a few factors into consideration. Clear communication ensures that your mechanic understands exactly what symptoms your vehicle is exhibiting. While you mostly likely won’t know exactly what the problem is, if you can describe the symptoms accurately, you can ensure that the mechanic has a better understanding about what is wrong with your car so they can fix it more quickly. Step 1: Write down the problems. When you start having issues with your vehicle, write down exactly what it is doing. This helps you remember exactly what symptoms your car has exhibited when you take it in. Otherwise, if you try to recall from memory what is going on, you might miss an important detail. You should include any specific sounds, sensations, and the behavior of your vehicle in your description, as well as any leaks or smells you have noticed. Step 2: Explain the problem clearly. When talking to the mechanic, make sure that you describe the problem in language that they can understand. Backfire: A loud bang that issues from a vehicle’s tailpipe or engine. Bottoming: This happens when the car bottoms out when going over a bump or high spot in the roadway. Often accompanied by a harshness felt through the steering column or by excessive noise. Bucking: A lurching of the vehicle felt when changing gears or after the vehicle hesitates. Dieseling: A term used to describe what happens after you turn the vehicle off and it continues to run briefly. Hesitation: A common problem where the vehicle suffers a temporary loss of power when accelerating. Knocking: A rapid rattling or knocking sound heard when accelerating. Misfire: This happens when the engine cylinders do not fire like they should, leading to a loss of power. Shimmy: When the vehicle exhibits a side-to-side motion felt through the steering wheels or tires. Sluggish: When a car does not accelerate strongly or smoothly ands feels like it is bogged down. Surge: The opposite of sluggish. When a car suddenly surges upward in speed and the engine exhibits higher RPMs. 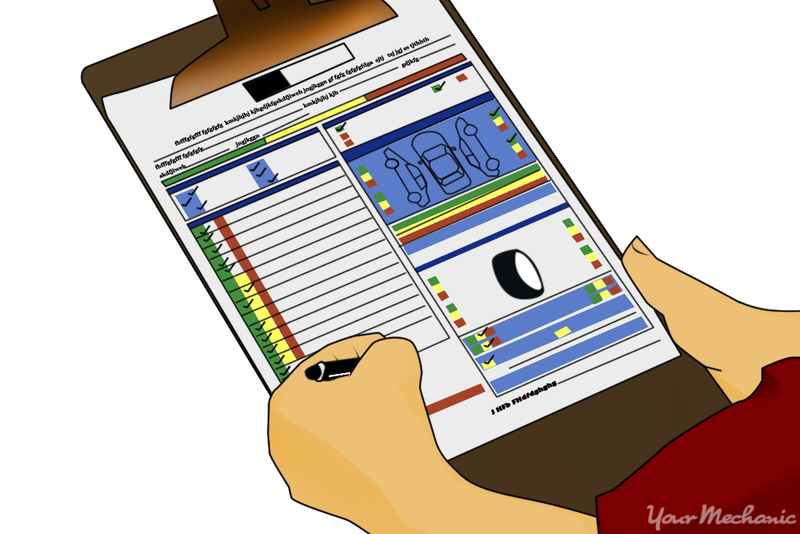 If you cannot explain the problem properly to the mechanic, or the problem cannot be detected upon inspection, you might offer to let the mechanic take the vehicle for a test drive. This is especially important if the problem only occurs while the vehicle is in motion. Leave it up to the mechanic to decide who should drive during the test drive. Step 1: Drive the car with the mechanic. Make sure to drive the vehicle in situations similar to when the problem occurs. If you are driving, make sure to drive safely and observe all posted speed limits and road signs. If the problem does not occur on the test drive, you may have to bring the vehicle back the next time the problem occurs. The final part of the process is getting an estimate from the mechanic on how much it costs to get the problem fixed. It is important that both you and the mechanic understand exactly what needs repair, and that you understand the exact costs associated with the repair. Step 1: Discuss the repairs needed. Have the mechanic explain what repairs your vehicle needs. You need to know what is involved and the length of time it should take. This allows you to borrow a vehicle or get a rental car if needed. Tip: Give the mechanic a good contact number to reach you. This allows the mechanic to contact you immediately, and can save time when making the repair. They also need the number to reach you in the case of any unforeseen problems. Step 2: Discuss the costs involved. Next, have the mechanic tell you how much any repairs should cost. At this point, it is OK to discuss which repairs are necessary and which can wait. Most mechanics understand that people are often on a budget, and will make recommendations on what they think are the most pressing repairs and which can wait. Do not try to negotiate the costs, as your estimate includes the part and the time involved in making the repair. Warning: Keep in mind that repair costs could go up if another problem is found while making the original repair. Make sure that the mechanic understands that you want notification in such cases. That way, the mechanic can explain the problem and you can make the ultimate decision on how to proceed. Step 3: Decide how to proceed. With the costs in mind, make a decision on what repairs to have done, if any. If you feel the mechanic’s estimate is too high, consider getting a second opinion or check with other repair shops to see what their rates are to fix the same problem and how long repairs will take. Tip: Keep in mind that most mechanics are not out to rip you off, but do need to make a living too. What they charge to fix a problem is what they charge – if you disagree with their prices, then you are free to take your vehicle elsewhere. Most repair shops charge a fee for a diagnostic. Ask what they charge before you have them look at your vehicle. A vehicle that needs repairs can lead to unwanted stress. By taking your vehicle to an expert mechanic, you find out what is wrong with your car and what you need to do to have it repaired, including the cost and the time involved in making the repair. If you are unsure how to proceed, you can ask a mechanic from Daks Toyota to get advice you can trust regarding how to proceed in this or any other auto-related situation.